Collected here together for the first time are the selected letters of one of the most influential and important activists in the American civil rights movement—the brilliant legal mind and foot soldier for justice, Thurgood Marshall. For twenty years prior to the Montgomery Bus Boycott, a rebellious young attorney with the National Association for the Advancement of Colored People (NAACP), Thurgood Marshall, struggled tirelessly to combat racism, discrimination, and segregation in schools, transportation, the military, businesses, and voting booths across America. This collection of letters, compiled and edited by Michael G. Long, and written by Thurgood Marshall during his tenure with the NAACP—long before he became a Supreme Court justice—reveals this remarkable man’s extraordinary intellectual development and invaluable contributions to the civil rights movement, highlighting his relentless work in helping secure equality and justice for all Americans. Long traces Marshall’s correspondence with the most powerful leaders of his day—J. Edgar Hoover, Dwight D. Eisenhower, NAACP leader Walter White, and many others—cataloging how Marshall was able to accomplish in the courts what Martin Luther King Jr. would work to do from the pulpit and on the streets. 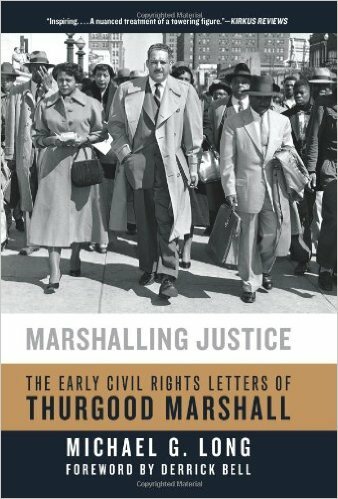 Through these letters, we discover a startling new portrait of Marshall and gain a deeper understanding of the influences that spurred his unrelenting advocacy for society’s most vulnerable. A window into the history and radical roots of the modern civil rights movement, these letters illuminate the strides that one man made, and the distance that still yawns between his goals and present-day reality.